Blue moons usually happen every 3-5 years, hence the well know phrase. 2018 has not one Blue Moon but two! I scrolled past this on my social media feed and was curious so I delved a little deeper. We’ve had a few Moon themed days because of this! If 2 full moons happen in the same calendar month the second one is referred to as a Blue Moon; because it doesn’t happen very often. We’ve put out a cheeky bit of Grimms to celebrate the Blue moon. A crescent, to represent the Moon and the Dream Tree to help guide us through our sleep. January 2018 started with a glorious full moon on my son’s birthday on the 2nd. There is also one on the 31st – this one is called a Blue Moon. Consequently February has a black moon as there is no full moon falling within it at all. In March we once again get two full moons mirroring the dates of January; one on the 2nd and a Blue Moon on the 31st. Next week’s full Moon is also known as a Snow moon with February traditionally marking the snowiest month of the year. I have this gorgeous Moon garland on my wall and it’s beautiful. We’ve been using this a lot this week to talk about the different phases. The foil catches the light and it’s a great learning tool for the boys. It frames each of their star signs; Capricorn, Aquarius and Gemini. I don’t go in for the horoscopes but you can’t change the set of stars you were born under and I love that each foil print represents each son. 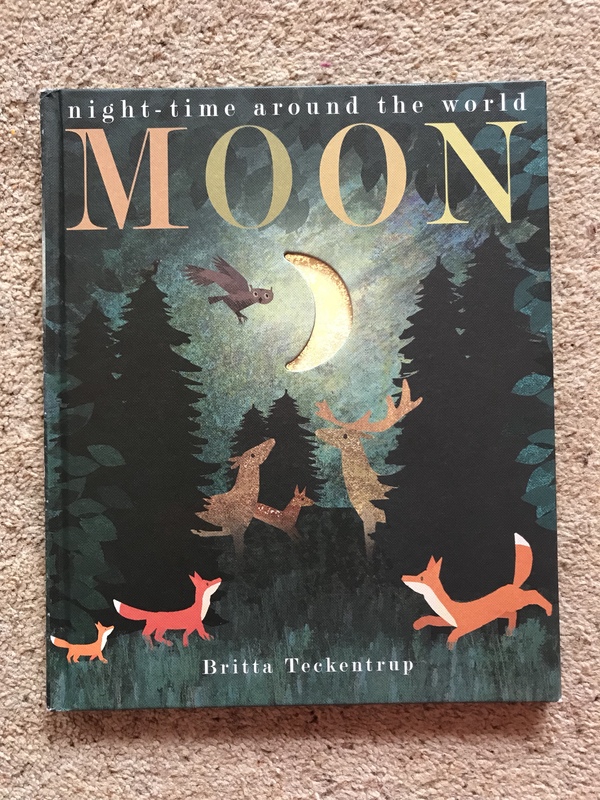 Our favourite bedtime story at the moment, rather appropriately is “Moon” by Britta Teckentrup. We have a few of her books and they are beautifully illustrated and are so educational. This books rhymes and it is lovely to read. It captures each of the boys in a different way, which is great that they can all take something from it. The story takes you through the journey of the moon on it’s cycle and explains to the reader it’s link to nature in such a beautifully simplistic way. The illustrations are stunning. The moon on each page is cut out so you can see the different lunar phases (which we explained to Edward and Oren) and the story is simple. It is a perfect book for the boys. I love books like these because you can read them over and over and still enjoy them. These aren’t just silly stories they’re educational and informative, whilst still capturing a child’s imagination and drawing them in. We’ve also been doing some Moon related shenanigans this week after school. We used Okönorm Clay and did our own take on the Lunar cycle. This clay is great because it doesn’t stain anything so I can have it out in the front room without having to worry about mess! Edward used my phone and read out all the information about crescent, waxing crescents and gibbous moons, Oren had a bash at spelling out some of the words and Loki…well Loki was just happy to be involved! 45 minutes of organised crafting and no fighting or moaning. Definitely a win! Even with Loki deciding his contribution to the task would be better if he sat on the table we still managed to get a lunar cycle out of the clay and successfully named each phase of the moon. They’re all looking forward to next week’s blue moon now and Oren is busy planning our next Okönorm clay adventure. Edward wants to do it with biscuits next! I love the moon and how significant it is to us, with regards to tide patterns and nature. We love that book too – it’s so beautifully illustrated and informative. There’s an app you can download that tells you which moon phase we’re in, as well as moon rise and set times. The boys looked like they had a great time! Despite the terrible photos they did have fun, much better than the usual after school carnage! Thanks Heather! It’s a lovely book. Bee and Tree are fab too – the illustrations are gorgeous!